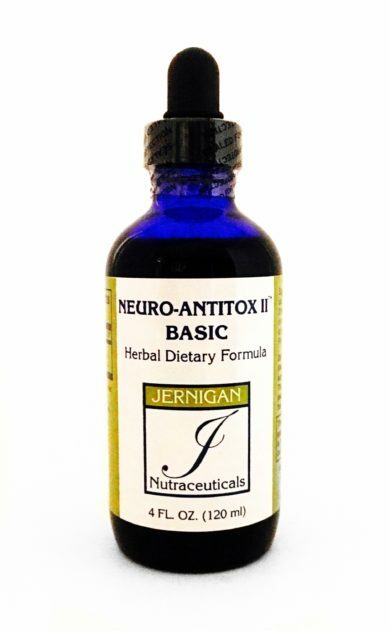 Good for global detoxification of the Lyme toxins, heavy metals, and for those who are unsure which specific Neuro-Antitox formula to take, this is our most popular formula. 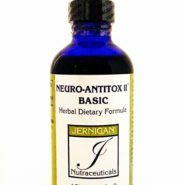 Unlike the other three Neuro-Antitox II formulas, Basic does not contain any sarcobioenergetic potencies. Toxicity: According to the criteria set forth by the FDA, all of the ingredients in the Neuro-Antitox Formulas™ are considered so non-toxic that no LD50 is required, much in the same way as any plant/vegetable. Side-effects: No direct side-effects have been reported in the literature for any of these ingredients. Each of these ingredients however is expected to mobilize various heavy metals from virtually any tissue in the body. There is the chance that these metals may become lodged in a more sensitive tissue than the tissue from which they came, causing new symptoms. This is true in any form of detoxification. New symptoms or a worsening of existing symptoms should be followed up with your health care professional and is usually remedied by increasing toxin releasing therapies, like Infra-Red Saunas, Ion-Cleanse foot baths, ST-8s.